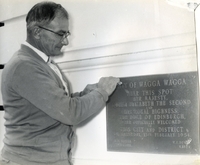 This plaque, which was placed near the location of the dais in Baylis Street, can still be seen on the side of the Historic Council Chambers. Thousands of school children gathered on Robertson Oval for the final appearance of the Queen and Duke. The Hon. 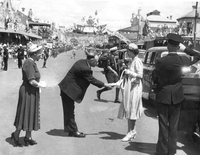 Eddie Graham, Member for Wagga Wagga and Minister of Agriculture, greets Queen Elizabeth as she alights from the open-top car in Baylis Street. Mrs Ivy Graham (we assume...) stands just a little behind him. These axemen (or woodchoppers) put on a display of their prowess with an axe for Queen Elizabeth and the Duke of Edinburgh at the Wagga Showground. 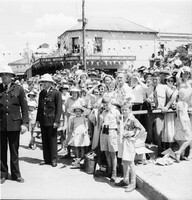 The Queen and Duke arrived at the Forest Hill airport a little after 1pm on a fairly hot day.in Wagga Wagga. 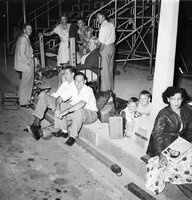 This temporary seating was set up out the front of the Victory Memorial Gardens in Baylis Street. 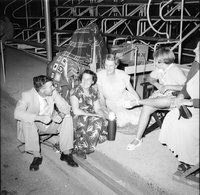 The dais, where Queen Elizabeth received Wagga's dignitaries, was positioned directly across the road in front of the Council Chambers. Hundreds of people waited patiently outside the Council Chambers and along the route of the Royal Progress to catch that one memorable glimpse of Queen Elizabeth and the Duke of Edinburgh. Soldiers lined the route of the Royal Progress, along with the crowds. Sadly, they weren't allowed umbrellas to help keep the sun off in the unrelenting February heat! These people, waiting for the Queen and Duke to arrive, are on the corner of Baylis and Morrow Streets, Wagga Wagga. The Lyric Music House cantilever verandah was even used as a balcony by a few people, hoping to gain a vantage point. 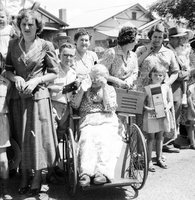 These people are ready and waiting for Queen and Duke to pass by, somewhere along the route of the Royal Progress through Wagga Wagga. 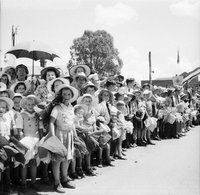 These cheerful people are lined up somewhere in Wagga Wagga on the route of the Royal Progress. 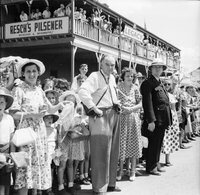 Crowds lined the verandahs of Baylis and Fitzmaurice Streets, so as to gain a vantage point to see the Queen and Duke as they passed by. These keen families grabbed prime position to see the Queen - across the road from the dais outside the Wagga Council Chambers. This keen family grabbed prime position to see the Queen - across the road from the dais outside the Wagga Council Chambers. The Wagga City Band is posing for the photographer on the dais outside the Wagga Council Chambers before or after the Queen's visit to the Riverina. Wagga had a number of these arches set up along the planned route of the Royal Progress. This particular one was in Baylis Street outside Great Southern Motors, just before the Morrow Street corner.